Is there anyone in the world more excited than a three-year-old girl with a brand new pair of shoes? Certainly not on that distant summer morning when little Iyu Natsuhara (“Yu” to her family) arrived home from a shopping trip with her mother, sister, and baby brother. She couldn’t help but admire her new footwear as she paraded proudly through the house. Yu’s mother Sen certainly would have tried to share her young daughter’s excitement, but the fact was that Sen was exhausted. In addition to caring for Yu and Yu’s four-year-old sister Mary, Sen had given birth to baby Frank just a few months earlier—three children all under the age of five. When Frank went down for a nap, Sen saw no harm in taking a much needed rest herself. She soon fell asleep. Perhaps the two girls were expected to nap too, but little Yu was far too excited from the morning’s activities. She convinced Mary that they should go outside to find their father so that he, too, could admire her pretty shoes. Their father Chiyokichi was tending the fields in front of the house, and the children knew he should be easy to find. The two little girls slipped out the door, being careful not to wake their mother. In 1911, the Pacific Highway connecting Seattle to Tacoma did not yet exist. Many commuters chose to travel between the two cities on the Interurban Electric Railway, then at the height of its popularity. The rail line ran directly in front of the Natsuhara’s home, separating the house from Chiyokichi’s fields. The girls would have to cross the tracks in order to find him. Mary and Yu saw a train in the distance and hurried across the tracks to the other side. But Yu’s precious new shoes did not arrive safely with them; one of them caught in the ties and slipped off her foot in her rush to cross the tracks. There was simply no way Yu could leave it in the middle of the tracks to be destroyed by the oncoming train. She broke away from Mary and ran back to retrieve her new shoe. At age three, she had no way of gauging the danger she was putting herself in; she simply made a child’s impulsive decision to reclaim her lost prize. Before she realized her mistake, it was too late. Yu was hit by the oncoming locomotive and killed instantly. The Natsuhara Family, understandably, was devastated by Yu’s loss. At a time when so many children were stillborn or died from common childhood diseases, Yu was, in contrast, a bright, healthy child. She had reached an age where her parents probably assumed that most of childhood’s lethal threats were behind her. Broken-hearted, her family buried her in the Auburn Pioneer Cemetery. At the time of Yu’s death most of the Japanese burials there were marked with wooden stakes or other simple markers. But the Natsuharas bought Yu a very special, very pretty heart-shaped, marble stone—the perfect marker for an innocent and excitable little girl, one whose loss would be felt by her parents for the rest of their lives. In the years after Yu’s death, the Natsuharas had more children, most of whom lived to adulthood (and at least one, Masaru, who did not). 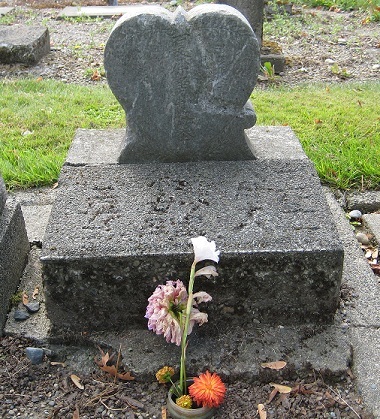 Their family plot at the cemetery grew, and Chiyokichi took on the voluntary role of caretaker when the cemetery’s maintenance was eventually turned over to Auburn’s Japanese community. It was a role he took very seriously; even when the area’s Japanese were incarcerated in far off internment centers during World War II, he managed to find ways to raise funds from his fellow internees for the maintenance of the burial plots back home. But despite Mr. Natsuhara’s efforts, the cemetery suffered both neglect and abuse during the War. When they returned, the Natsuharas found it so badly choked with weeds and brush that they needed scythes to uncover the tombstones—at least, those tombstones that remained. Several were missing outright, including Yu’s special heart-shaped marker. Dismayed by the desecration, Chiyokichi poured a much less ornate concrete slab and inscribed it with Yu’s name to mark her grave. When he and Sen eventually passed away themselves, it was with the belief that their little girl’s special stone was lost forever. Many years later, in 1990 to be exact, a construction worker drove a bulldozer at a construction site across the valley. A much needed addition was being built onto Highline High School. The driver was leveling the site so that a new foundation could be poured. He was working at a depth about seven feet below the original grade when he noticed something odd in front of his bulldozer’s blade: a rock that looked almost heart-shaped, one whose regular contours could not have been formed by nature. The teeth of the bulldozer’s blade had scraped the rock badly, and these scrapes revealed a sparkling white surface that winked back at him in the summer sun. The driver turned off his machine and climbed down from the cab for a better look. This clue led them to the local telephone directories where they eventually found a listing for Frank Natsuhara, the little brother who was just a baby when Yu died back in 1911. Frank, thrilled at the stone’s recovery, cleaned the stone and re-set it at Yu’s grave in the Auburn Pioneer Cemetery. Forty-five years after the end of the War, Yu’s long lost stone, against all odds, had finally been rediscovered. The extraordinary story of Iyu Natsuhara’s special tombstone struck a chord with all who heard it. The Seattle Times wrote an article about the stone’s repatriation to the cemetery, speculating that it might have been left at the high school back in 1945 during an earlier construction project. The AP picked up the story, and the article was reprinted in newspapers across the country. 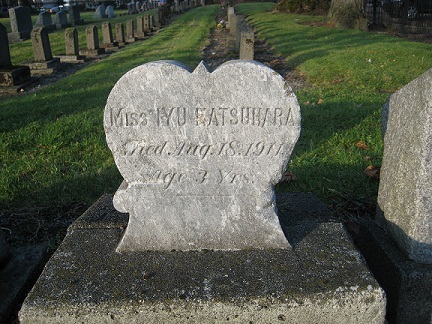 The coverage gave Yu’s unique, heart-shaped tombstone a certain amount of local fame. Certainly Yu, if she could have heard the story, would have been pleased with all the attention.